The NYT reports today that US Post Office is recording the “meta-data” (that is, a photograph of the outside of the envelope) for all of our snail mail. Gotta say, they’re spending lots of time, energy, and money getting lots and lots of information on we the people. 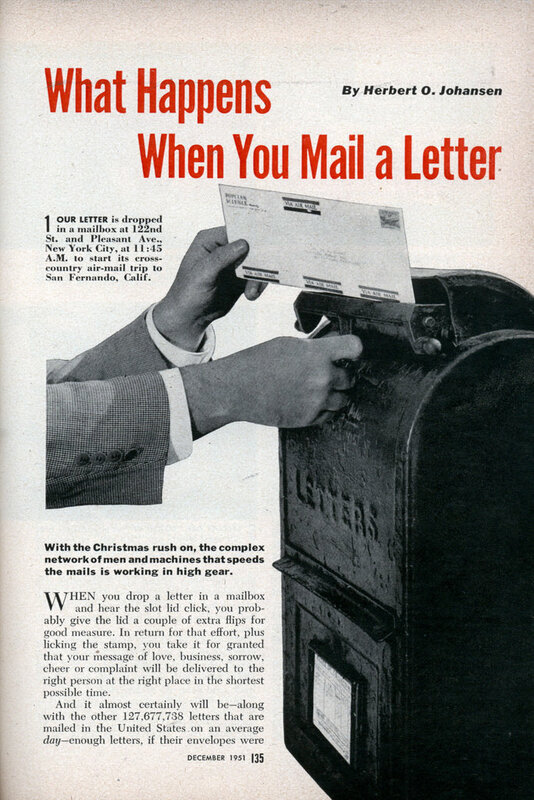 By the way, I grabbed that mailbox image from an article posted on the site Modern Mechanix, which has cool posts about past technology and past visions of future technology. This one is a story from 1951 when they had pneumatic tubes connecting post offices in Manhattan (see photo below). I find it amazing how frequently the past is more futuristic than the present. I'm a philosopher in New England. I like to think I know a thing or two about science, especially physics (less about biology). I'm particularly interested in physicalism -- in figuring out the relationship between physics and all other descriptions of our world.